Pickles. Why’d it have to be pickles? Early readers can be a tricky kids’ book genre. I’m not actually sure that’s the preferred term – sometimes they’re called early chapter books, beginning books, easy readers – but you’d know one when you saw it. They’re the books kids read in between picture books and chapter books. They’re the books that they cram into long, low shelves at the bookstore, because they’re usually series titles, so there’s a million of them, BUT they’re so damn thin, it’s almost IMPOSSIBLE to actually read their spines and find the title you’re looking for. (Am I alone in this?) When I think of an early reader, I think of titles like Junie B. Jones or My Weird School, and kids of a certain age LOVE THEM. They can be great gateway books into the world of chapter books, but, like in most kids’ genres, they can also be really, really mass-produced, lazy, and terrible. So, when I see a truly superior example of an early reader, it stands out, which is one reason why I think the world of Eric Wight’s Frankie Pickle series. 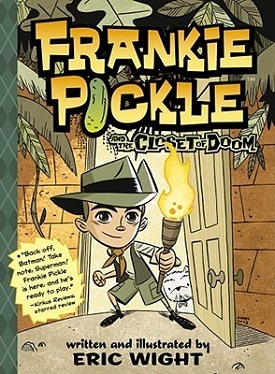 There are only three books in the series – Frankie Pickle and the Closet of Doom, Frankie Pickle and the Pine Run 3000, and Frankie Pickle and the Mathematical Menace – and, man, I wish there were more. But two things really help distinguish Frankie Pickle from its competition: words and images. First, regarding the words, Wight is a very clever writer with a good ear for dialogue and the kinds of fun alliteration and nonsense language that new readers really love encountering. The stories aren’t anything groundbreaking, but they’re short, sweet, and very well-told. When my daughter reads a Frankie Pickle book to herself, she laughs. Even just saying the name of Frankie’s family – the Piccolini family – tickles her funny bone and Wight does a nice job of making the text quick and interesting without making it difficult for newer readers to digest. However, while the stories are fast and fun, I have to admit, for me, the real draw of the Frankie Pickle books are the images. Let me just put this out there – The three Frankie Pickle titles are the BEST-LOOKING early readers I’ve EVER seen. They’re gorgeous. Absolutely gorgeous. 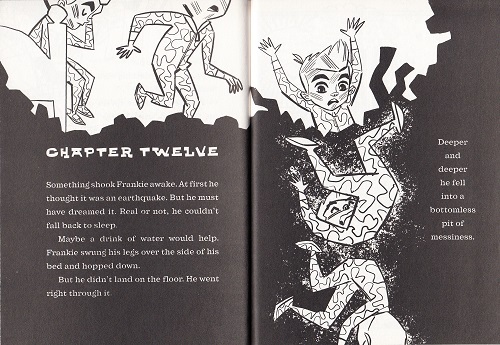 Wight is a beyond-talented illustrator and each Frankie Pickle book is ingeniously designed as a hybrid between a typical early reader and a comic book. The effect is that each title feels vividly alive. Wight’s artwork pulls readers through each page and, suddenly, they’re rewarded with Frankie’s flights of fancy brought to life in expertly rendered comic book panels. And can I just say – as a longtime comic book fan, I am a big, big kids’ book art snob. I can be extremely critical of the illustrations in my daughter’s books, particularly in the early readers, where, so often, the art feels like an afterthought. But Wight is the real deal and his illustrations remind me of the works of Bruce Timm and Darwyn Cooke, which (for those unfamiliar) I regard as a big, big compliment. These books honestly make almost every other early reader we own look like something I could’ve thrown together on my work Xerox machine in ten minutes. 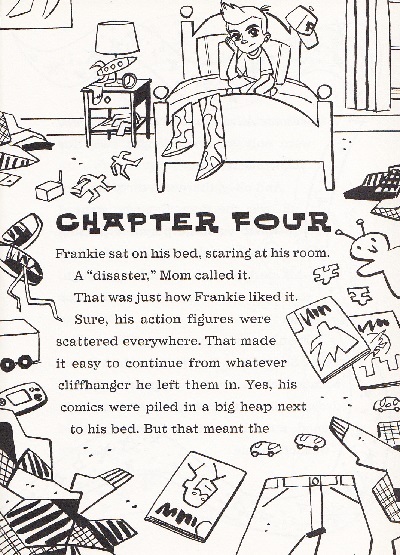 There’s artistry behind the Frankie Pickle stories, both in their words and images, and I think kids pick up on that. 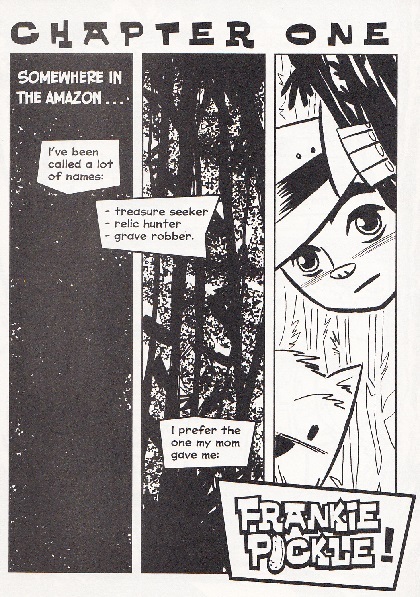 They’re simple stories told very well and their formatting is remarkable. If you’ve got a reader at home who’s reluctant to move past the 32-page picture book, try handing them one of Wight’s Frankie Pickle books. At the very least, it’ll grab their attention. AGE RANGE: The stated range is 7 to 10 years, but there’s nothing objectionable about the content, so you could read them to much younger kids. PAGE COUNT: 96 pages each. RELATED WEB SITES: Here’s the link to the official Simon & Schuster Frankie Pickle page that has info on all three books. 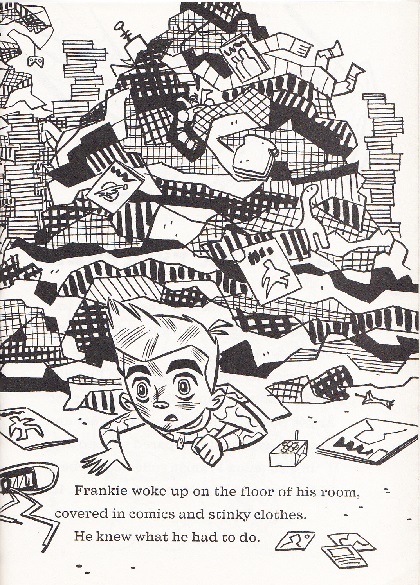 Oddly enough, I’ve seen ads for a fourth Frankie Pickle book – Frankie Pickle and the Land of the Lost Recess – but I can’t find any evidence online that it was ever published. Bummer. BUY IT, BORROW IT, OR FORGET IT? : These are inexpensive, really original titles. If you’ve got an early reader hungry for more material to consume, I would have no problem recommending these to buy. Supergirl: Cosmic Adventures in the 8th Grade by Landry Q. Walker, illustrated by Eric Jones – This graphic novel collects a short-lived DC Comics series that is, seriously, one of the best kids’ comics I’ve read in a long time. A very gangly, actually-looks-like-a-girl version of Supergirl crashes to Earth to visit her famous cousin and finds herself stuck here and forced to suffer the indignities of eighth grade. It’s so much fun. We’re picking up a big stack of books today at the library. It looks like I have a couple more to pick up! The thin titles- YES. So glad it’s not my almost-40 eyes This series looks perfect for my 6 yr old: thanks for the heads up!